Cool! It's a mug that looks kind of like labware, but it says right on it that it's for potable stuff only. I now have a mug that says "potable." 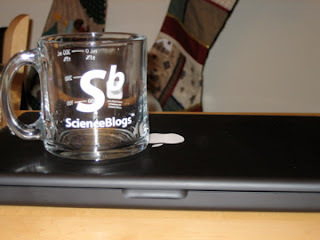 This mug came to me because the nice people at Science Blogs were running a contest for their gazillionth commenter. I was, of course, not that commenter but I was a commenter and they selected some of us at random to receive this fabulous prize. I had nearly forgotten about it, and then this thing of beauty arrived in the mail today to put a smile on my face. 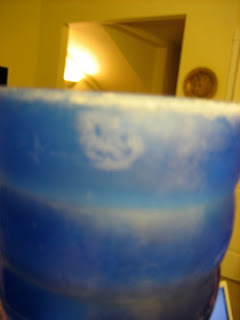 Speaking of forgotten contests-I do indeed remember that prizes need to be awarded in our pareidolia contest. My slowness in this has everything to do with the fact that I could not for the life of me figure out what I'd be sending off as a prize. For future reference, it helps to have a prize in mind before announcing a contest. Competition was fierce, fierce I tell you and the judging was difficult. I had to walk all the way upstairs to ask Andy to choose a number between one and four inclusive. He chose "two." "The smiley face of the Comedian's badge from the Watchmen comics by Alan Moore." Well done, Sir. Your prize has been selected at random from the collection of mugs currently clean and in my cupboard. Please email me your preferred postal address to claim your prize. And, in the spirit of the Science Blogs people who helped inspire this contest, if the rest of you most excellent contestants will send me your mailing addresses, I will issue a limited number (three, to be exact) of commemorative "First Steingruebl World Enterprises Contestant" postcards and send one your way. Thank you to one and all for reading and for playing along and for being patient while I sort out this prize-giving stuff. It's an honor to have you here and reading what I write. Wow. Alan Moore would be so proud. Wow, I love that cup! The "Reason for the Season"